California would lose $24.3 billion in federal funding by 2027 for low-income health coverage under the current Republican plan to replace the Affordable Care Act, according to a new state analysis released Wednesday. The bill, up for a vote in the House on Thursday, represents a “massive and significant fiscal shift” from the federal to state governments by setting caps on spending, reducing the amount of money available for new enrollees and eliminating other funding for hospitals and Planned Parenthood, the analysis said. The analysis, based on internal cost, utilization and enrollment data, was sent Tuesday to the state’s secretary of Health and Human Services. Although the analysis didn’t explain how the state would deal with the federal cuts, Cantwell said it would have to look at changes to eligibility, benefits or provider rates — or all three. The Republican bill, called the American Health Care Act, would dramatically change funding for the Medicaid program, known as Medi-Cal in California. Since its inception, Medicaid funding has been open-ended, based on need. Under the new bill, federal money would be capped either through block grants or fixed per-capita amounts. Medi-Cal provides coverage to 13.5 million low-income residents, about half of California’s children and a third of the adults. About 3.7 million people of those became newly eligible for the publicly funded health coverage through the Affordable Care Act, helping to reduce the state’s uninsurance rate from 17 percent in 2013 to about 7 percent in 2016, according to the UC Berkeley Labor Center for Education and Research. The public insurance program is funded jointly by California and the federal government and provides health, dental, mental health, long-term care and other services. The Affordable Care Act allowed states to expand their Medicaid programs in 2014 to low-income childless adults, and the federal government is paying nearly all the costs for those new beneficiaries. California health officials said they estimated that Medi-Cal costs would exceed per-capita caps by nearly $680 million in 2020, with the gap growing to $5.28 billion by 2027. That spending limit could have a “devastating and chilling effect” on any increases in provider payments or plan rates, according to the analysis. According to the analysis, the state would face additional costs from other federal cuts, including to a program that pays for in-home care for elderly and disabled residents. In addition, the proposed freeze on federal funding to organizations that provide abortions would make the state responsible for $400 million in payments to Planned Parenthood, which serves more than 600,000 people in Medi-Cal and a state family planning program. House Republicans unveiled their much anticipated health law replacement plan Monday, slashing the law’s Medicaid expansion and scrapping the requirement that individuals purchase coverage or pay a fine. But they opted to continue providing tax credits to encourage consumers to purchase coverage, although they would configure the program much differently than the current law. The legislation has been the focus of intense negotiations among different factions of the Republican Party and the Trump administration since January. The Affordable Care Act passed in 2010 without a single Republican vote, and the party has strongly denounced it ever since, with the House voting more than 60 times to repeal Obamacare. But more than 20 million people have gained coverage under the law, and President Donald Trump and some congressional Republicans have said they don’t want anyone to lose their insurance. Complicating the effort is the fact that Republicans have only 52 seats in the Senate so they cannot muster the 60 necessary to overcome a Democratic filibuster. That means they must use a complicated legislative strategy called budget reconciliation that allows them to repeal only part of the ACA that affect federal spending. Beginning in 2020, the GOP plan would provide tax credits to help people pay for health insurance based on household income and age, with a limit of $14,000 per family. Each member of the family would accumulate credits, ranging from $2,000 for an individual under 30 to $4,000 for people ages 60 and higher. The credits would begin to diminish after individuals reached an income of $75,000 — or $150,000 for joint filers. The legislation would allow insurers to charge older consumers as much as five times more for coverage than younger people. The health law currently permits a three-to-one ratio. California Healthline – In some recent emails, readers asked about what to expect as Republicans move to overhaul the health law. Should people bother paying the penalty for not having health insurance when they file their taxes this year? Will they be able to sign up on the exchange for 2018 after their COBRA benefits end? Here are some answers. I didn’t have health insurance for part of last year and thought I’d get stuck paying a penalty. Now the new administration is talking about not enforcing the insurance requirement. Could I really be off the hook at tax time? California Healthline – Thousands of Covered California enrollees face higher-than-expected bills from their insurers because the exchange sent incorrect tax credit information to the health plans. The exchange confirmed it gave insurers wrong subsidy information for about 25,000 policy holders, resulting in inaccurate bills. Insurers are now sending out new bills correcting the errors, and in most cases that means higher premiums than consumers had initially anticipated. Freeman said she owes about $330 per month more on her premium than she had expected. Lopez said Covered California originally sent consumers their correct tax credit amounts in notices during the renewal period, but it gave the incorrect amounts to their insurers. However, Kevin Knauss, an insurance agent in Sacramento, said a Covered California representative told him in a phone conversation that consumers had found incorrect tax credit amounts when they signed onto their online Covered California accounts. Tax credits are the income-based subsidies that about 90 percent of Covered California enrollees receive to lower their monthly premiums. In another mistake related to tax credits, Covered California discovered in December that about 24,000 policy holders hadn’t provided consent for the agency to verify their income, even though the agency thought they had. Without that consent, thousands of consumers lost their 2017 tax credits, at least temporarily. Lopez said most consumers affected by the latest mistake will owe more out of pocket than they originally thought, and that health plans are entitled to bill them for the difference. The recent tax credit error has left consumers like Freeman feeling shocked and frustrated. She had struggled through administrative headaches with her Covered California plan last year, so when it came time to renew it — or choose a new one — for 2017, “I was very cautious and nervous. I shopped around and got information from the folks at Covered California and Blue Shield,” she said. She said Covered California gave her inconsistent information about the amount of tax credits she would receive. So she called the exchange twice to confirm the number, and was told both times it would be $800 a month. That was more than she expected, and it allowed her to afford a more expensive plan with better coverage, she said. After receiving an updated bill last week that showed her actual tax credits were hundreds of dollars less than expected, Freeman called Covered California again and was told the problem had been caused by a “computer data error,” she said. The agent told her there was nothing Covered California could do and that she should try to negotiate directly with Blue Shield, she said. Enrollees in this situation can call Covered California’s special hotline at 844-623-2070 for more information. If their updated premiums are unaffordable, there’s still time for enrollees to switch health plans before open enrollment ends on Jan. 31, Knauss said. But Freeman already has seen new doctors with her new plan. “Why must the consumer carry the burden of these errors?” she asked. The bill considered the most likely prototype for partial repeal of the Affordable Care Act would result in as many as 32 million more people without health insurance and would double premiums in the individual insurance market, budget scorekeepers said Tuesday. The estimate by the Congressional Budget Office and the Joint Committee on Taxation was on the impact of the bill passed by the Republican Congress in 2015 and vetoed by President Barack Obama last January. The analysis was conducted at the request of Senate Democrats. “The number of people who are uninsured would increase by 18 million in the first new plan year following enactment of the bill,” said the report. That increase could reach 32 million in 2026. Republicans called last year’s bill a “dress rehearsal” for what they might try this year, because it was a “budget reconciliation” bill that needs only 51 votes to pass in the Senate and cannot be filibustered. Last week the House and Senate passed a budget resolution instructing specific committees to begin work on dismantling the health law, using the same budget reconciliation process. Only items that directly impact the federal budget can be included in such a bill, however. That meant last year’s legislation would have repealed most of the ACA taxes that help fund the health law’s programs, the penalty for individuals who don’t have coverage and the tax subsidies for people to purchase coverage, as well as the funding to expand the Medicaid program. But it could not change the health law’s regulation of the insurance market, including the provision requiring insurers to sell to people with pre-existing health conditions. The result, said CBO, would have been fewer healthy people purchasing coverage, which would leave the insurance pool with higher percentage of sick enrollees and drive premiums up. Insurers, according to the report, would likely stop offering coverage in the individual insurance market. Democrats were quick to pounce on the estimate as evidence that Republicans are on a dangerous path. “Repeal and delayed replacement is repeal,” outgoing Health and Human Services Secretary Sylvia Burwell told reporters at a briefing. “CBO has just stated with analytics and real numbers what happens during that interim period” when part of the law is taken away and part remains. “Today’s CBO report is a clear repudiation of the Republicans’ misguided plan to repeal the Affordable Care Act,” said Rep. Richard Neal, D-Mass., the ranking Democrat on the House Ways and Means Committee. Republicans cautioned, however, that last year’s bill might not be a good reflection of what will happen in the coming weeks and months. New America Media – As early as next year, undocumented immigrants will be able to buy health insurance on Covered California, the state’s online marketplace. That is, if Uncle Sam gives the state a federal waiver to do so. 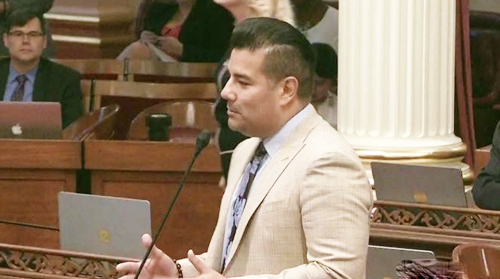 In a bipartisan vote of 27 to 8, the California state senate on June 2 approved SB 10, the Health For All Waiver authored by Sen. Ricardo Lara, D-Bell Gardens. Under the proposal, the state will ask for a waiver so that undocumented adults can buy coverage on Covered California. However, undocumented immigrants would not be able to get any subsidies when making their purchase. An estimated 390,000 immigrants who earn an income too high to qualify for Medi-Cal could purchase health care coverage through this program – if they can afford it. Sen. Lara introduced the waiver as a result of President Obama’s signature health care legislation, the Affordable Care Act (ACA), which bars undocumented immigrants from purchasing health insurance on the online marketplaces set up by state or federal governments. The ACA subsidizes the costs, making the premiums affordable. States were, however, given a so-called 1332 waiver option so they could fashion a new coverage system customized for local preferences. Proposed state changes have varied widely, from minor fixes to substantial redirections. In California, the state with the largest immigrant population, an estimated 3 million adults and children have been left without insurance because of the ACA barrier. Thanks to efforts spearheaded by Lara, nearly 170,000 undocumented children became eligible last month for full health coverage through Medi-Cal, the state’s name for Medicaid, the health insurance program for low-income people. Governor Brown, the fiscally conservative leader, is expected to sign the waiver request because no state spending is involved. “Beyond the important symbolism of inclusion, this proposal will provide a practical benefit for many California families with mixed immigration status, who will be able to buy coverage together, even if some family members are eligible for subsidies and others are not,” noted Anthony Wright, executive director of Health Access California, the statewide health care consumer advocacy coalition. In seeking the waiver, the state must certify that the proposal will not diminish coverage or affordability on the exchange, and will not add costs for the federal government. Then the federal Department of Health and Human Services and Department of Treasury have 225 days to make a decision. By expediting state approval of the bill, Lara hopes to have the request considered by the Obama administration before he leaves office. Huntington Park resident Stephanie Martinez was just five years old when her parents brought her illegally to live in the United States. Now 23, she’s one of an estimated 853,000 people in the country who have temporary, quasi-legal status through President Obama’s Deferred Action for Childhood Arrivals (DACA) program enacted in 2012. Today she has health insurance, but like so many in her situation the road to coverage was filled with obstacles, complicated by her family’s mixed-immigration status and a combined household income slightly too high to qualify for health subsidies but too low to pay for private insurance. Under DACA, young people between the ages of 16 and 31 who were brought to the country illegally as children can temporarily avoid deportation and work legally in the U.S., provided they meet certain eligibility requirements, such as attending or completing high school and passing a criminal background check. For many who have qualified there’s a sense of normalcy, of no longer living in society’s shadow, that is unless like Stephanie you live in a “mixed-status” home, where some members of your family are citizens, legal residents, or DACA recipients, but others are undocumented. When enacted in 2014, the Affordable Care Act (ACA)—also known as Obamacare—explicitly excluded DACA recipients – often referred to as “dreamers” – and undocumented immigrants from buying health insurance from state or federally sponsored health insurance marketplaces and the premium tax credits, subsidies and other savings on marketplace plans. “It’s political,” Gabrielle Lessard, a health policy attorney with the National Immigration Law Center told EGP, explaining that the Obama Administration knew it would face a backlash if the undocumented and DACA recipients were allowed to take part in the program, even though they pay into the tax pool that subsides the coverage. In her early twenties, Stephanie wasn’t worried about not having health insurance; after all, she’s young and healthy. The same couldn’t be said for her father Alvaro Martinez who suffers from diabetes and needs ongoing medical attention, but struggles to get care because he is undocumented. So last year, when Stephanie’s father asked her to apply for health coverage for the family through the state’s health exchange, Covered California, she gladly filled out the application at a local health fair sponsored by AltaMed. Marketing Coordinator Laura Ochoa works on AltaMed’s “Dreamers and Medi-Cal” program, which screens DACA recipients for eligibility for the state’s Medi-Cal program for low-income families. DACA recipients can qualify for coverage under the state’s recognition of the Permanently Residing in the United States Under Color of Law (PRUCOL), a public benefits eligibility category created by the courts. According to US immigration officials, “an individual may be eligible for Medicaid (Medi-Cal), if the individual is an alien residing in the United States with the knowledge and permission of the Immigration and Naturalization Services (INS) and the INS does not contemplate enforcing the alien’s departure,” as in the case of DACA recipients. California and New York see DACA recipients as having met the PRUCOL standard, Lessard said. Requirements to qualify for California Medi-Cal for DACA recipients include having a valid work permit, a social security number, identification and proof they are low-income, Ochoa told EGP. But Stephanie’s case was more complicated. Her family’s combined household income of $46,000 exceeded the maximum Federal Poverty Level (FPL) of 138%, or $33,534 a year for a family of four to qualify for Medi-Cal. Their mixed-immigration status, her parents are still undocumented, also made group coverage through the health exchange unlikely. Private insurance is too expensive, Stephanie said. A study by the UCLA Labor Center’s Dream Resource Center found that one in seventeen children in the U.S. live in mixed-immigration status homes. Stephanie attends Santa Monica College and works part-time. She says she’s still dependent on her family for necessities like food and the roof over her head. According to Ochoa, Stephanie’s best option is to apply as an individual. She said students who earn about $10,000 could qualify for Medi-Cal even if their parents claim them as deductions. “If they are part-time students and part-time workers, most likely they are eligible,” she added. Earlier this year, Stephanie applied as an individual and was approved for Medi-Cal coverage effective June 1 through the L.A. Care Health Plan. While exploring her family’s options, Stephanie also discovered that Mr. Martinez qualifies for coverage under Los Angeles County’s Ability to Pay (ATP) program, which offers affordable health services to L.A. county residents who do not qualify for Medi-Cal, Medicare or Covered California plans, regardless of their immigration status. 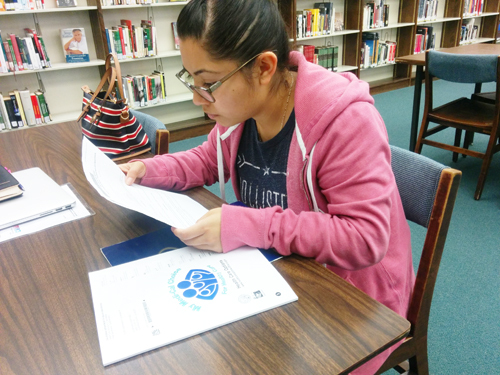 The program is free to “individuals with incomes at or below $1,367 per month” and has a “low-cost [option] for individuals with incomes above $1,367 per month,” which works for Mr. Martinez. ATP applicants only pay for the month they visit the hospital or its partner clinics. Services include doctor and ER visits, hospital care, tests and medicines, explains the Health Services of L.A. County website. The “Undocumented and Uninsured” study states that the health of undocumented Californians is crucial to the wellbeing of the state. They recommend expanding ACA to all Californians regardless of their immigration status or income level. “There’s no such thing as individual health; all health is public and communal,” states the study. A bill by state Sen. Ricardo Lara, SB 10, the Health For All Waiver, recently approved by state lawmakers, could allow undocumented immigrants to buy health coverage through the Covered California online marketplace, but would first require federal approval. Martinez told EGP she is happy she now has health insurance, but still worries about her father’s ongoing health issues. “He has more need than me,” she said. The three-part series was produced as a project for the California Health Journalism Fellowship, a program of the Center for Health Journalism at the USC Annenberg School for Communication and Journalism. To read Part 1: DACA and Obamacare: Who Qualifies? To read Part 3: SB10 is it worth it? What is an exemption?